How Can We Stabilize Bismuth in Potassium-Ion Batteries? Add Salts! The large-scale manufacturing and widespread demand of consumer electronics in modern societies call for batteries with affordable prices. Potassium-ion batteries are one of the economical alternatives to lithium-ion batteries, as the cost of potassium is much lower than lithium. However, these types of batteries have yet to be commercially available, partly due to the lack of high-performance and stable anode materials. Bismuth (Bi) is a promising anode material for potassium-ion batteries, because of its substantially higher theoretical charge-storage capacity than the conventional ones. Unfortunately, its poor durability severely hinders the applicability. Now the drawback of Bi has been successfully addressed by increasing the electrolyte concentration. This breakthrough, demonstrated by Chuan-Fu Sun and coworkers from Chinese Academy of Sciences, China, was recently published in Chemical Science. Sun and coworkers investigated the interplay between the electrolyte concentration and the charge-storage performance stability of Bi nanoparticles (Figure 1a). They identified the optimal concentration of the solute, potassium bis(tri-fluoromethylsulfonyl)imide, to be 5 M. Under this condition, the irreversible electrolyte reduction reaction on the Bi surface experienced the highest resistance. Impeding this unwanted reaction thus elongated the lifespan of Bi electrodes. In addition, the concentrated electrolyte resulted in thin layers of the reduction products being deposited on the Bi surface. This allowed ions in the electrolyte to easily penetrate the surface coatings and interact with the encapsulated Bi nanoparticles, maintaining the intrinsically high capacity of Bi (Figure 1b). Other concentrations either led to rapid battery failure or significantly reduced capacity. Figure 1. (a) A scanning electron microscopy image of the Bi nanoparticles. (b) The change of the Bi electrode capacity vs. charge-discharge cycle number with different electrolyte concentrations. CE: coulombic efficiency. 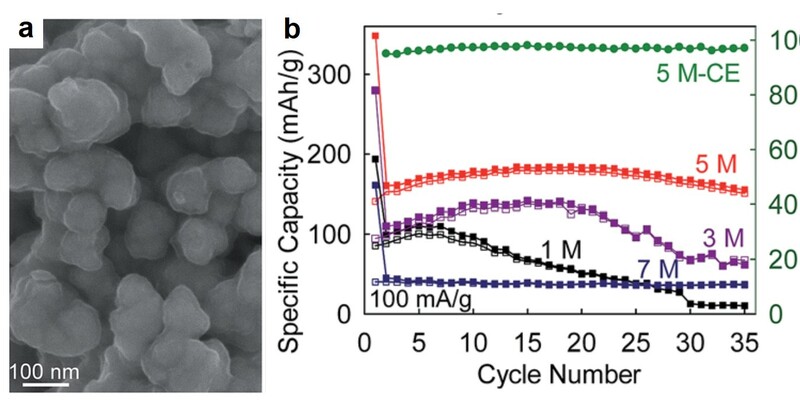 This work innovates the design and development of commercially viable potassium-ion batteries. The strategy of increasing the electrolyte concentration could possibly be adapted to solve electrode instability issues associated with other rechargeable batteries.